When the London City Council decided to create a new boulevard called the Aldwych during the late 19th century, two British entrepreneurs saw a considerable opportunity for personal prosperity. Amid the road’s construction, the two entrepreneurs, Edward Sanders and Thomas Wild, purchased real estate at the northern end of the Aldwych for the creation of a grand hotel. They both hoped that their hotel would enthrall the great flood of people that were certain to travel along the new road. Named the Waldorf Hotel after the famous millionaire, William Waldorf Astor, the men hoped the Astor family name would affix great prestige onto the building. Sanders and Wild were not disappointed. Opened in 1908, the hotel rapidly became one of the most prestigious businesses in all of London. Exhilarating dance parties happened regularly at the Waldorf Hotel’s Palm Court ballroom. 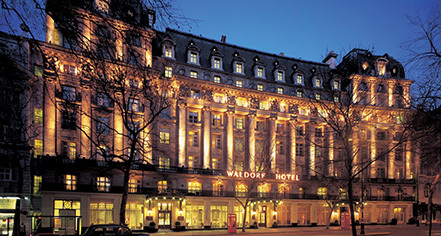 Now known as The Waldorf Hilton, London, the hotel has maintained its stature ever since. The Waldorf Hilton, London offers 298 guestrooms across six main room categories, of which six are suites. Recently renovated, the rooms provide both comfort and convenience. All the accommodations are lavishly furnished and feature marvelous marble baths, as well as luxurious amenities. Six magnificent suites are available for guests who desire to travel in grand fashion. The Waldorf Hilton, London pays tribute to the grand cafés of Europe at Homage, serving mouth-watering English fare that is tempered with a modern European twist. Just a few steps from the lobby, Good Godfrey’s Bar and Lounge offers delightful cocktails designed by the bar’s expert staff. The Waldorf Hilton, London has also been a popular destination for hosting countless events, whether casual business meetings or a lively wedding ceremonies. All the hotel’s seven unique meeting spaces are elegantly designed and emit a serene ambiance well-suited for any occasion. Guests can reserve the opulent Palm Court ballroom or the lavish Adelphi Suite for their special event. Situated in the vibrant West End, The Waldorf Hilton, London is steeped in British culture. Many of the city’s most exciting attractions are within walking distance of the hotel. The building is right in the heart of the glamorous theater district, with some of the best playhouses and concert halls located nearby. Shopping enthusiasts will gravitate toward the Convent Garden and Oxford Street to visit the finest storefronts in the entire United Kingdom. Guests with an adventurous side can also catch a ride on the massive London Eye, obtaining breathtaking sights of city’s expansive skyline. Countless historical landmarks tantamount to British history surround the hotel, such as Trafalgar Square, Big Ben, and Buckingham Palace. Several of these timeless structures are even recognized as UNESCO World Heritage Sites. 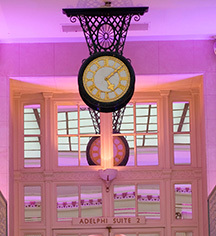 The Waldorf Hilton, London is perfectly placed to launch a memorable journey into London’s majestic cityscape. The Waldorf Hilton, London, a member of Historic Hotels Worldwide since 2018, dates back to 1908. In 1958, Director Roy Ward Baker filmed scenes from the Titanic film, A Night to Remember, in the Palm Court as the interior of the ship. ATM: An ATM is available on-site. Cancellation Policy: Cancellations policy may vary based on rate type. Deposit: Two (2) nights deposit is required at time of booking. Extra Person Fees: £10 per person. Pet Policy: Pets are not allowed; service animals are allowed. Rollaways: £30 per night, subject to availability. When the London City Council decided to create a new boulevard called the Aldwych during the late 19th century, two British entrepreneurs saw a considerable opportunity for personal prosperity. Learn more about the History of The Waldorf Hilton, London .